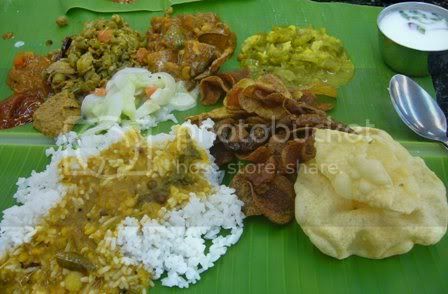 If one’s life can be determine by food preferences, I believe that I might be an Indian in my past life. As much as I love Chinese cuisines, I am strangely drawn towards Indian food, my five senses transfix on the myriad of spices, smells, tastes and textures. Indian cuisines are complex. Even the simplest cooking involves clever blends of various spices. But of course, there are some simplicities, such as its roti (bread), which ranges from easy to long preparation and the choice itself is numerous! Every roti is different from one another; some made with rice flour, some gram flour and many more that I have yet to learn and discover. After bouts of exercise early one morning, the first thing that hit my mind for breakfast is some Indian fare. So I walk all the way through The Curve (shopping mall in Malaysia) to Restaurant Penang Nasi Kandar, right outside Tesco, for my Indian breakfast fix. 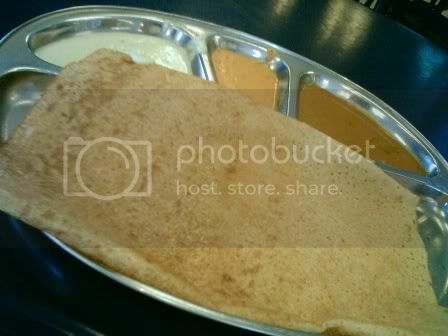 On the way there I had already picture tosai in my mind. Why, I love the taste of tosai, slightly tangy and its texture soft to bite, crunchy on the outer layer certainly plays one palate. I like my tosai with the coconut chutney (on the left) and the middle chutney, I can’t make out what it is but it is tangy, from tamarind I believe, and some spices, hope someone can enlighten me here. It pairs real well with the tosai, adding more to the tanginess and sourness. Of course I would also eat it with dhal (on the right); then again, I eat my dhal with every other roti. Then its time for lunch, my hunger pang starts playing with my head again. I crave for more Indian fare. Then I thought of banana leave, from a shop I once was recommended to by a friend, which I found the branch right here in my neighbourhood. Banana leave is actually a kind of meal where your food is serve on a clean banana leave, and the perks are, you can ask to refill as many times as you want with no extra charges. It consists of only vegetarians fares but you can separately order other meats. When one eats banana leave, one tends to indulge a little bit, as it is addictive and the thought of able to fill to one’s content is extremely inviting. Therefore, as I am set on getting fit before work, I think twice bout this choice of lunch. The meal was great. I absolutely love the vegetable curries. The usual fare are the lightly spicy long beans, tangy and superbly spicy brinjal with black-eyed peas, one mild veggie (on the right, which I’m not sure what it is) and the light yoghurt cucumber (I forgot the proper name for this) which is really refreshing. Then there comes the condiments, coconut chutney (again), and one really salty and sour chutney where I accidentally bite into the sour fruit (not sure what fruit, now I sound like an Indian food enthusiast who knows nuts). Then there are the keropok (chips), where there is the ever famous papadum (though I have tasted better ones out there) and also the potato chips, which tasted like heaven, sliced thinly, heavily spiced and deep-fried. Ah, such indulgence. Then you can opt to drown your rice in dhal or chicken/fish curry. Lastly, there is rasam and one light tangy milk (in the picture, which I don’t know what it is, if someone can tell me I’ll be so grateful, never mind if its just a guess) and also yoghurt to soothe off all the spice, which are now madly meld on your tongue and in your tummy. Take note that, they will charge an extra dollar for the yoghurt as we had asked to clarify when we saw it on our bill. In addition, my friend ordered a mutton curry, which is reasonably priced with good portion and which of course, tasted good. Maybe I was an Indian in my past life, but indeed much of my knowledge on the food must have been loss during my transition to this new life. I cannot really name most of the food yet or even to cook them, but one thing for sure, I absolutely love to eat them. One day I might just be able to learn the secrets of Indian cooking, but of course not to forget my own origins. I always think the spices and condiments have some kind of drug in them that makes one keep going back for more, but to me, that’s a good thing. Oh no, I am addicted.